The Audemars Piguet Royal Oak Chronograph is one of the thinnest and most superb automatic chronographs in the world. Perfect workmanship and the finest caliber technology define this watch, which has a characteristic porthole design. An extremely flat chronograph with a porthole design – that is the essence of the Audemars Piguet Royal Oak Chronograph. The sporty luxury watch from Audemars Piguet first came to market in 1997 in celebration of the 25th anniversary of the legendary Royal Oak. The relation between the two timepieces is unmistakable: Both feature an octagonal bezel with eight hexagonal screws as well as an intricately engraved "tapisserie" dial. Differences arise when it comes to the technology inside the two watches, as the Royal Oak Chronograph can measure periods of time via a chronograph function. On the other hand, the classic Royal Oak contains an elegantly minimalist two-hand movement that displays the hours, minutes, and date. At just under 11 mm, the case of the Royal Oak Chronograph is especially flat for a chronograph. In terms of material, you have the choice between stainless steel, yellow gold, white gold, rose gold, or a mix of titanium and platinum. The titanium and platinum version came out in 2017 for the 20th anniversary of the Royal Oak Chronograph and is limited to 500 pieces. The lugs and bezel of this exclusive model are made of 950 platinum, while its case is made of titanium. How much does a Audemars Piguet Royal Oak Chronograph cost? If you're looking to purchase an Audemars Piguet Royal Oak Chronograph, you can choose from one of two case sizes: 39 or 41 mm. Both cases are best suited for somewhat smaller wrists. Earlier 39-mm models are listed under the reference number 25860 and cost about 18,300 USD pre-owned. You can get a pre-owned watch with the reference number 26300ST for about 2,300 USD less. Gold variants can be found under the reference number 26022, for example. The price of a pre-owned piece in rose gold comes in at around 26,400 USD. The yellow gold and white gold models change hands for about 23,200 and 29,000 USD, respectively. Newer 41-mm models bear the reference number 26331. Models in stainless steel sell for 23,500 USD new and 22,800 USD pre-owned. Set aside about 50,000 USD for a new watch in rose gold, while a pre-owned piece is somewhat less expensive at 44,800 USD. The limited titanium and platinum edition costs around 44,100 USD in mint condition and 42,100 USD pre-owned. There are several special editions of the Audemars Piguet Royal Oak Chronograph, including the City of Sails Alinghi. This timepiece is limited to 1,250 pieces and pays tribute to the Swiss sailing team Alinghi, which won the 2003 and 2007 America's Cup. It's also relatively affordable, coming in at around 14,500 USD pre-owned. 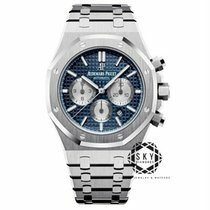 The Royal Oak Chronograph Leo Messi is significantly more expensive. This stainless steel timepiece with a tantalum bezel had a run of 500 pieces and costs about 29,300 USD pre-owned. There are only 400 examples of the rose gold version, which demands around 44,700 USD. The platinum edition is the highlight of this series: Only 100 such pieces exist, driving its price to over 55,100 USD. The Audemars Piguet Royal Oak Chronograph Pride of Italy is yet another interesting special edition. This stainless steel watch is also limited to 500 pieces. You can purchase one of these watches for about 25,500 USD in mint condition and 25,200 USD pre-owned. Watch fans and collectors are constantly on the lookout for the next watch to add to their collections. While searching, they often come across comparable models from various manufacturers, resulting in even more questions. Many enthusiasts will shop around for the total package that best suits them. Anyone looking at the Audemars Piguet Royal Oak Chronograph is sure to come across the Patek Philippe Nautilus Chronograph. Both watches were designed by Gérald Genta and therefore look remarkably similar. However, Patek uses in-house calibers to power their timepieces while Audemars Piguet does not. Each Royal Oak Chronograph contains the caliber 2385 based on the 1185 from F. Piguet. However, this "small" difference has a major impact on the price: A pre-owned Patek Philippe Nautilus Chronograph with the reference number 5980/1A-001 costs over 67,300 USD, making it almost three times as expensive as the 41-mm Royal Oak Chronograph in stainless steel. The Rolex Daytona in stainless steel is another highly-coveted watch with a stopwatch function. The ref. 116500LN with a ceramic bezel from 2016 is so popular that long wait times are par for the course. All this hype has also had an effect on the price: Mint-condition models currently cost about 20,300 USD, while pre-owned pieces come in at around 19,600 USD. With a list price of 13,100 USD, the price of the Daytona ref. 116500LN has already risen rapidly. Even if the Royal Oak Chronograph is more expensive than the Rolex Daytona, it still comes with great value for money and makes a great investment. That said, the chances of the Daytona increasing in value are probably better. At the end of the day, it all comes down to your personal taste and intention: Do you want a watch as an investment or as a design icon with a 70s feel? 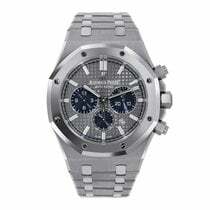 There are numerous editions of the Audemars Piguet Royal Oak Chronograph available. Each model has the characteristic porthole design, octagonal bezel, and eight hexagonal screws keeping the bezel on the case. The slots in the screws are perfectly aligned, creating a harmonious circle. The famous Swiss watch and jewelry designer Gérald Genta designed this watch. He also designed the Patek Philippe Nautilus and the Ingenieur SL from IWC (International Watch Company). The screw-down push-pieces and the screw-down crown are both six-sided. Since 2012, the timepiece has measured 41 mm in diameter. Older models were a bit smaller, with diameters of 39 mm. Thanks to its flat case, the Royal Oak Chronograph easy fits under any shirt cuff. However, it is so much more than a companion for black tie events: It pairs just as nicely with a polo or t-shirt. One feature of the Royal Oak Chronograph is its unique "tapisserie" dial, called "Grande Tapisserie" by Audemars Piguet. The pattern is found on many other Royal Oak dials. The manufacturer produces their guilloched dials using rare, automated engraving machines. The Royal Oak Chronograph is available with many different dial colors, including black, blue, silver, or brown. As this Royal Oak is a chronograph, it has multiple subdials. The small seconds is located at 6 o'clock, the 30-minute counter is at 3 o'clock, and the 12-hour counter is at 9 o'clock. The date display is located between 4 and 5 o'clock. The central stopwatch hand is a part of the chronograph function; you can use it to time fractions of a second. There are also many different options for the strap. The Royal Oak is traditionally paired with a metal bracelet; depending on the case material, it is made of stainless steel, gold, or titanium. However, there are also straps made of rubber or hand-stitched alligator leather. If the case is gold, it features a gold clasp as well. The Royal Oak Chronograph also has a perfect finish. Its polished and satin-brushed surfaces couldn't be of a higher quality. The strap fits comfortably on your wrist, not pinching or otherwise disturbing you. The caliber 2385 is responsible for the Royal Oak Chronograph's slender nature. At just 5.5 mm thick , it's one of the flattest automatic chronograph movements in the world. The Valjoux 7750, probably the most successful automatic chronograph caliber to date, is 7.9 mm—almost 2.5 mm thicker than the 2385 from Audemars Piguet. The Valjoux 7750 is used by many prominent manufacturers such as TAG Heuer, IWC, and Breitling. The Audemars Piguet caliber 2385 has a 40-hour power reserve. It has a balance frequency of 21,600 alternations per hour (A/h), which is equal to 3 Hz. The movement is comprised of 304 total pieces and features an 18-karat gold winding rotor that winds the movement unidirectionally. The chronograph is controlled via a column wheel. The caliber 2385 is based on the 1185 movement from Frédéric Piguet, a member of the Swatch Group. F. Piguet is Blancpain's internal movement supplier. The Geneva-based manufacturer Vacheron Constantin uses the caliber 1185 as well, namely in their Overseas collection. The Audemars Piguet caliber 2385 is thus not an in-house movement. However, there are very few manufacturers who make their own chronograph movements. Patek Philippe is one of the few. The Nautilus Chronograph with reference number 5980 is powered by the caliber CH 28-520 C. The differing calibers help explain the significant price difference between the Nautilus Chronograph and Royal Oak Chronograph.